I LOVE overnight recipes! Do all the prep work before hand, then just pop it in the oven when your ready to eat! So easy! Sometimes when company is visiting, the last thing you want to do is be slaving in the kitchen all morning trying to make enough food to feed the masses. This recipe makes it so simple for busy and hectic mornings. This may be one of my new favorite french toast recipes! I absolutely loved it and so did the rest of my family! Do all the prep the night before, then just pop in in the oven for an easy and delicious breakfast that your whole family will love! Sounds yummy! How many eggs though? 12 eggs. Sorry about that. It sometimes deletes ingredients. Kind of an important one too :) thanks for bringing it to my attention. I love baked french toast and with a few tweaks, I think this will be my next birthday weekend breakfast! And yes, how many eggs? This would be perfect for a sunday brunch at my parents' house! They love it when I cook them breakfast and peaches are my mom's favorite fruit. Looooove it Nikki! This looks so delish! I will have to try! I'm so tired in a morning, that I'd rather do all my work beforehand! And if peaches are involved... even better. Have you tried it with fresh fruit, too? I made this with blueberries and I didn't like how the cream cheese just stayed put. Do you cut yours into tiny chunks. It was good but gross when you got a clump in your mouth. What do you so to yours to make it work? I love the peaches yummy! Love your recipes but I find them hard to read because of the print color. Anyone else have this problem? Mmm... I'm hosting a brunch later this month and I think this might just be on the menu! Girl, this looks amazig! I'm having some family stay with us soon, and this would be a great idea for breafast. That way I'm not waking up like 2 hours before they do to get everything ready in time! :) Love your photos, like always! Keep up the yummy work! Also, thank you for hosting the party. I linked up this week, yay! Made this last night and baked it this morning. I halved the recipe since we have a small family. I spread cream cheese on the slices of bread THEN cubed it. Didn't want clumps of cream cheese, and this method seemed to eliminate that. I had 2 helpings myself, and everyone told me it was really good. Thanks for sharing this recipe!! Oooo, this looks so good!!! I was printing up the Oreo Popcorn recipe and saw this on your sidebar :-) Printed this up too! BTW, thank you for having a print button! I have one on my blog too and wish everyone did. Makes it so much easier. What would half this recipe version be, a family of 4? Thanks! 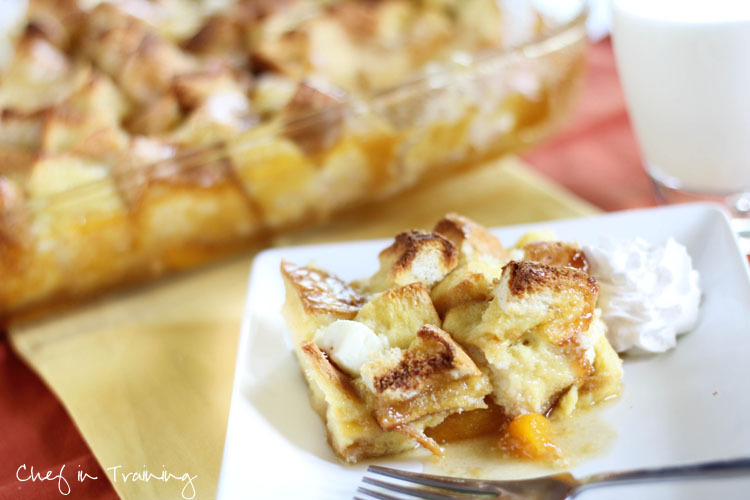 Did you use sliced or peach halves for this recipe? Looks delish, btw...going to try it tomorrow! Sorry, I hope I am not to late to reply. I used peach slices :) Let me know how you like it!